In Bruce Charlton’s recent post on this blog he makes the point that “Fantasy or Fairy Tale (done well) feels much realler than 'real life’”. This is something that every imaginative reader recognises but few take any further. Specifically, it is not taken to the next logical step which says it feels more real because it is more real. Not in its details, of course, but in its spirit. Why is that? Bruce provides a convincing answer based on the ideas of Owen Barfield and Tolkien whose insights he combines to give a real and comprehensive theory of imagination. Here I would just like to add my thoughts on what it is that gives myth and fairy tales their enduring appeal, and the sense they have of opening reality up to something greater than normal everyday experience of it allows. I think that good fantasy (that is, fantasy based on imagination rather than fancy as in Coleridge’s important distinction) has at least some of the following elements, and it is the presence of these that can make it seem more real than reality. And the reason they can do this is because they are actually true, just not known according to our present limited, semi-mechanical, turned in on ourselves world view. We don't know them or accept them with our rational minds but something deep within us responds to them as truth so that when these ideas are skillfully presented to our imagination, and our imagination is sufficiently finely tuned, they have the power to remind us of a time when they were consciously known in the world (the time of original participation which can also be seen as a pre-lapsarian time) or else to prefigure for us a future when their innate qualities are recaptured but in a way that includes our developed mental capacities and individuality. As I say, with our outer mind we reject these ideas because, from the standpoint of modern science, there is no evidence for them, but in our hearts we see that they do indeed correspond to reality - even when we don't believe that in our heads. A major part of our contemporary perception of reality is the feeling of separation from the wholeness of life with a resultant feeling of meaninglessness. Imaginative fantasy restores meaning to existence by opening life up to wider horizons or adding dimensions to it that have been lost by our current contracted mode of self awareness. In order to progress from our earlier passive participation in the wholeness of life to a more active and creative involvement with it our vision had to be narrowed and our sense of reality restricted. We had to lose the feeling of oneness to gain the sense of self. This loss is deeply felt but well written fantasy can give us re-entry into a more inclusive mode of consciousness when it incorporates some or all of the following elements. Its purpose is to engage the imagination which, properly understood, is an organ of perception not just an image making faculty or fabricator of make believe. Some of the ideas present in myth and fantasy that can make it seem more real than reality are the following. Not all of them are always included but some of them must be. Nature is alive as a whole and, in its parts, full of spirits. Life extends vertically as well as horizontally so there are aspects of it that we cannot perceive directly now but which can still make an impact in this world. Good will eventually triumph over evil. Such things as beauty and nobility are objective realities and reflections of a higher order of being. The outer world of nature reflects the inner world of consciousness and vice versa. Feelings of mystery and awe are natural responses to something profound and true. The list could be continued but the general point is that we currently live in an outer world where randomness and general purposelessness are the order of the day. Imagination takes us to an inner world of meaning where beauty is truth, and myth and fantasy are bridges into that world insofar as they recognise that there is something behind the scenes of outer appearance. A final point. None of this means there is anything intrinsically spiritual about myth or fantasy or even imagination, but they can point to the spiritual. The world of myth and fantasy is a middle ground between the material world and the spiritual world, and that is why it seems more real than the former while, in its turn, is less real than the latter. A discovery of 2016 was the work of Geoffrey Ashe from the early 1970s - with books discovered by me, gifted to me by John Fitzgerald, and lent me by my brother - this last being the really excellent Camelot and the Vision of Albion, from 1971. I would strongly recommend Camelot and the Vision of Albion to all who are hopeful of an awakening of Albion - by rights, this book should be regarded as a classic of British history of ideas. 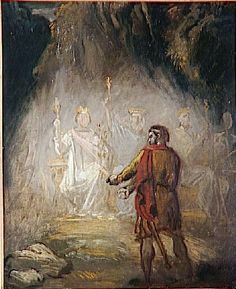 Camelot and the Vision of Albion has many facets - a close analysis of the person of Arthur and his relationship to the successful (for several decades) resistance to Anglo-Saxon invasion - which changed the future of Albion. The implications of the South Cadbury excavations are described in detail.And the book also ranges extremely widely over national 'myths' of revival - including nationalism, communism, Gandhi and many other examples. There is a fascination section concerning the nature of 'Titans' throughout history, and how the Arthur myth absorbed many of these aspects. Perhaps the most impressive part (for me) was the discussion of William Blake's prophetic books - Ashe provides a 'key' to these extraordinarily difficult yet profoundly mystical works by Albion's only poet-prophet; and in doing so Ashe makes an extremely important contribution to this vital aspect of understanding. Let us try to define the archetype which is constant throughout, the active ingredient in the spell. The stories vary, but they always tend the same way. There were gods before the gods, kings before the kings, Titans before Olympians, Britons before English; and their reign was a golden age. There was a profounder Christianity in the wave-encircled realm of the Celtic West, before the church as we know it. Then the glory faded. Injustice and tyranny flowed in. Zeus usurped the throne of heaven. Prometheus was bound. The sea encroached. The Round Table broke up. Arthur succumbed to Mordred. The Saxons conquered Britain. The Grail was lost and the land became waste. But the depths are formative. The place of apparent death is the place of life. The glory which was once real has never actually died. This is the British myth, of which at least a large part can be shown to descend from remote antiquity. I know of no fully developed parallel myth anywhere else. As a poetic statement the British myth is indeed unique. But it is a statement of a broader psychological fact. It reflects a human phenomenon, a mode of thought and behaviour, that can be traced through the world in a profusion of forms: one of the strongest constituents in history, and one of the least recognised. The fact that Owen Barfield did not enjoy The Lord of the Rings is evidence of a lack of empathy with Tolkien's work; and indeed I have not found any serious engagement of Barfield with Tolkien in any of the writings or interviews. Barfield was, of course, at least superficially familiar with Tolkien's ideas - but I get no sense of Barfield having grappled-with Tolkien's theoretical writing - certainly not in the way that he did with the work of CS Lewis. I am thinking particularly of the essay Lewis, Truth and Imagination (in the 1989 collection Owen Barfield on CS Lewis). Specifically, Barfield here notes that Lewis - for all his manyfold use and advocacy of Imagination - never developed an explicit theory of Imagination. Yet for Barfield a theory of Imagination, and in particular of how Imagination may lead to 'real' knowledge, is very much needed now; as it has been since the time of Coleridge's brief but highly suggestive work on the subject in the early 1800s. However, in contrast to Lewis, a theory of Imagination was precisely what Tolkien actually did develop - in his definition and defence of Fantasy in the famous essay On Fairy Stories. Barfield certainly knew this essay at some level; since he was one of the other contributors to Essays Presented to Charles Williams (1947), where On Fairy Stories was originally published. What Barfield (apparently) missed, was that Tolkien’s argument about Recovery contains, with different terminology, a theory of Imagination; and the seeds of a much more powerful explanation of Fairy Tale/ Fantasy providing actual knowledge, and being more real than (so-called) ‘real life’. Serious readers already know that Fantasy or Fairy Tale (done well) feels much realler than 'real life'; but what is so-far lacking, is an explanation for why and how this deep conviction may be factually true. Tolkien’s argument concerning the truth of Faerie focuses on the possibility of what he terms Recovery. The idea is that Fairy Stories (or Fantasy) include both magic, wonder, the fantastic - and also entail the creation of a different, complex but internally-consistent world. Tolkien therefore describes the Fantasy author as a subcreator - the maker of a wonder-full-and-coherent Secondary world within the Primary (and divinely-created) world. The reader's imaginative inhabiting of this magical 'Secondary world' is what allows a refreshment of our appreciation; and this the Recovery (in Imagination) is what Barfield would have termed Participation. Participation is the state of being in the world, an undivided reality, which we all knew as children; and which also characterised earlier, especially tribal, types of human society. In this form it was an un-self-conscious and immersive Original Participation. Participation was simply how-things-are and accepted as such - we participate quite spontaneously - and without and freedom of choice - simply because we experience ourselves as part of the greater totality. But successful Fantasy is an example of what Barfield termed Final Participation; a free, chosen, self-conscious, self-aware and (yet!) real participation with the world that takes place in Thinking: specifically in Imagination. The contrast is that with Original Participation we are simply IN the world and unaware of a distinction between us and it; while with Final Participation we have full analytic knowledge of all distinctions yet experience the reality of loving relationships that makes everything cohere - cohere lovingly precisely because things are distinct. From Fantasy as Tolkien said - and by the power of Imagination, as Barfield might have added - we come to appreciate the realities of our (primary, 'real life') world, but refreshed because we have come across familiar basics such as men and women, bread, stone, trees... in the magical and coherent context of a Secondary world. The key to the value of Fantasy – here and now – is its contrast with the modern world: Modern ‘reality’ is most deficient in the most important aspects of Life. We are alienated from the world - our Self is cut-off from experienced relationships with anything else: nihilistic solipsism is a constant threat. Fantasy may indeed be our only sustained experience in which these real-realities are encountered. But how is it that Fantasy may be able to supply what the Primary word so horribly lacks? Our imaginative participation in an internally consistent world of wonders, provides us with stimuli, with perceptions, that do not automatically get plugged-into the subversive and inverting theories of modernism. The magic and wonders of Fantasy quite naturally and spontaneously attach themselves to our built-in, universal concepts – those mythic understandings and interpretations of the ‘collective unconscious’, or our shared divine-endowments. And it is these universal concepts which enable us to apprehend and share reality. These interpretative idea I have drawn from the early philosophical work of Rudolf Steiner - especially A Philosophy of Freedom; which Barfield knew deeply and regarded as of primary importance. I can only presume that Barfield's lack of sympathy with Tolkien's world view was what (apparently) prevented him from perceiving that Tolkien's theory of imagination could easily and quite naturally be completed by Steiner's and Barfield's 's insights into the nature of 'Thinking about Thinking' (to use a phrase of Barfield's, descriptive of what he did). If Barfield had 'joined forces' with Tolkien (in an intellectual sense) - I think they could have provided - 70 years ago - a clear and comprehensible theory of imagination, including an explanation of how Fairy Story may yield real knowledge. And this is a theory which can be, and indeed has been, tested by many millions of readers of Tolkien, Lewis; and other great fantasy worlds such as are subcreated in The Wind in the Willows, Narnia Chronicles, Watership Down, and Harry Potter - to mention only a few of my personal favourites. These I know, from experience, to be real-and-true; what was previously lacking was only an explanation for how this might plausibly 'work'. Barfield and Tolkien, taken together, seem to provide a satisfactory answer. I had a particularly inspirational teacher at primary school, between the ages of 10 and 11 - what used to be called Junior 3. Her name was Mrs. Hughes, and she introduced me to so much that has been absolutely central to my life since - literature, mythology, history, art and more. I remember staying behind after class on our first day - a warm and hazy September afternoon - to fill in a form of some kind. My eye was drawn, I recall, to the pictures on the walls, scenes from myth and legend that I was encountering for the first time - Jason and the Golden Fleece, the Round Table, and the Rainbow Bridge of Asgard, to name but three. Raphael's School of Athens was there too, next to a picture of a man with a crown on his head. It was the crown, not the man, that captivated my mind. He had dark hair, a pinched face, and clenched white fingers. But the crown was gold and round and glowed from within with a light and fire of its own. "Who's that, Miss?" I asked. "Richard III," replied Mrs. Hughes. I nodded vaguely, not yet recognising the name, but I view that episode now as a high and solemn moment - my first meeting with a Shakespearean king. G. Wilson Knight (1897-1985), like my young self, was captivated and enchanted by the Crown. Like Mrs. Hughes, he was an inspirational teacher, chiefly at the University of Leeds. He was a poet, an actor, a theatrical director and a scholar of English Literature, best known for his works of Shakespeare criticism, such as The Wheel of Fire (1930), The Imperial Theme (1931) and The Crown of Life (1947). I reflect on Wilson Knight's oeuvre often. When I do, an image comes to mind - my old school, the long corridors, Mrs. Hughes's room - empty now, save for the sunlight streaming through, the rough-hewn altar in the middle, and the golden, gleaming crown lying on top, waiting for someone - myself, perhaps - to touch it, feel it, weigh it, savour it, then draw a deep breath, take the leap of faith and place it on his head. ... Though we live in an age of rationalism and attempts to raise man as man, with little conscious admission of man as a crowned or crowning being, we go sadly astray if we forget them. In all matters engaging the most immediate and fearful problems of our existence we know that drama, the opposition of parties in Parliament and Court of Justice, is our first guide; but there is always also, as in a work of art, some symbol, some higher fusing power, or its emblem, to unify our opposites, or at least to suggest their unification. If we cannot resolve our conflicts, we must at least imagine a dimension in which they are, or might be, resolved; which perhaps means, in Christian terms, looking forward, or up, to the advent of Christ in glory. Such, then, is the symbolic function of the Crown, not only itself dramatic, but also signifying the resolution and the purpose of the drama within and beyond which it exists. This is, fundamentally why Shakespeare's work is so royally alive in our time; why it is acted, not only in Britain and America, but in Europe, in India and Japan; and in Russia. Shakespeare's drama, with its fanfares and ceremonial, abounds in kingly ritual; and his people speak, move, act royally. Villains or heroes, it is no matter; it all lies deeper than ethic. We have for long talked of the Crown as the link binding an empire of free communities; that is true, and it is a great conception, herald and pattern, it may be, of a yet greater. But meanwhile we can speak of another, and related, link, which may indeed prove to have some bearing on that greater conception as yet unshaped; a link, or rather a golden thread, putting, as Puck has it in A Midsummer Night's Dream, 'a girdle round the earth'; the golden thread of Shakespeare's poetic royalism which, despite all barriers, yet binds, as does nothing else, the world. Everyone loves a good Christmas carol and though most of the ones we are familiar with today are from Victorian times when Christmas as we now think of it was invented, there are some wonderful ones from earlier centuries when it was a purely religious festival. One of my favourites dates back to the 13th century and was actually mentioned by Chaucer in The Miller's Tale where it is sung by the clerk Nicholas. Chaucer calls it by its Latin title of Angelus ad virginem but there is an English version too which I prefer because of the rich and robust sound of the words and a greater sense it gives you of being taken back to the Middle Ages. The song is probably French in origin but it adapts very well to anglicisation. It has a wonderful lilting melody and like many carols you feel you could dance to it. It certainly has a feeling of joy. Wikipedia says it was probably Franciscan in origin and it does have that sweet simplicity you would associate with St Francis. The song tells the story of the Annunciation when the angel Gabriel appears to the Virgin Mary to announce her divine destiny and ask her if she will accept it. Her humility and grace when faced by this stupendous news is deeply touching. Here she is confronted by a great angel of the Lord and all she asks is how this thing can happen since she is a maid. Nothing about herself. When the miracle is explained to her she accepts it instantly and gives herself over completely to the task. In this recording by St George's Canzona the tune is given a rather rumbustious folk music performance which suits it quite well though the sense of mystery might be somewhat lacking. Only the first verse is sung. This is a more reflective performance, perhaps more in keeping with the momentousness of the occasion. All the verses are sung. Of senne and devles might." Ich am, that her aboven is. Of motherhood will have the bliss." Warthurw us kam good won. Christmas is a complex and multi-layered celebration and feast. Christians are correct in pointing out that it is most importantly about remembering and celebrating the Birth of Christ; but neo-pagans and other non-Christians are also correct that there was already a Winter Solstice-related feast before Christ - and this remains an important aspect of the event, especially in relation to the character of Father Christmas or Santa Claus. I have nearly always found Christmas to be a special time of year, including when I was not a Christian; but being Christian certainly adds roots, significance and reality to the occassion. The pre-Christian aspects could be termed both astronomical and biological. The astronomical aspect is presumably a consequence of Christmas being just after the Winter Solstice; and suggests that there must have existed a sophisticated scientific priesthood able to measure the length of days; and detect when the shortest day had just been passed so they could begin to organise a celebration of the (true) New Year. The biological aspect was that there was still plenty of stored food and fuel to stage a feast - only tempered by the need to keep enough in store to see enough people through the 'hungry gap' of spring, and until the next growing season brings fresh supplies. These are good reasons for a post-Solstice celebratory feast - but this would be of spiritual significance only insofar as there was a society where Sun and The Light were accorded the status of deity. The aptness for celebrating the birth of Christ is obvious; and the cultural elaboration of the Nativity story created a very special time of year: when the spiritual comes closer to the everyday than at any other point of the calendar. Let us all at Christmas be sensitively aware of this fact; and alert for those communications and intuitions which we may now most confidently expect. Altogether, it is clear that Lancelyn Green has much of relevance to contribute to Albion Awakening! A sentence in John Fitzgerald's recent post set me thinking. He wrote "The body of work left behind by the Inklings has helped re-mythologise the world and baptise the contemporary imagination". I haven’t read much by any of the other Inklings and I hadn’t even heard of them when growing up, but that sentence sums up the effect that Tolkien and CS Lewis had on me as a child. I’m sure they had a similar effect on countless others too. Indeed, I sometimes think that without them (and a few others but them principally), children growing up in the mid to late 20th century would have been left almost completely spiritually bereft. Most of us had very little exposure to real spiritual truths and what we did have seemed formal and remote. But the stories of these two writers brought the spiritual world alive and did so (and this I think is very important) in a way that not only opened up the imagination but was also Christian. The world was re-enchanted and done so in the light of Christ. Modern Christianity often seems like a fire that has burnt itself out. Whether that is because of the paucity of real saints (saints are the lifeblood of any religion) or because it has lost touch with its roots or because it has become infected with social and political ideologies or because it is now more concerned with the letter than the spirit or because it has desacralized itself or because it frequently denies the truth and power of its own mythology and symbolism or because it has severed its connection with the imagination or because it focuses too much on this world and not enough on the next, is almost beside the point. (Actually all these things are linked). The fact is it has lost its glowing and full-bodied colours of yore, its sense of being lit from within, and become a black and white thing of two dimensions. And with its truth attacked from the outside and its vitality sapped from within, as well as a tendency to accommodate itself to what is trying to destroy it, it is now in many ways a faint shadow of its former self. But, as John Fitzgerald pointed out, Tolkien and CS Lewis helped revive Christianity by re-establishing it in the world of the imagination. The former covertly, the latter more obviously but they both did it and they did it in a way that many people either didn’t notice or didn’t much care about if they did, thus getting beneath the prejudices instilled in the modern mind. Furthermore they brought back a sense of Tradition which after the Second World War appeared to have been completely abandoned by all the clever people intent on building their soulless world of modernity. I mean by Tradition a connection to real things, both natural and spiritual, that humanity had established over centuries but which was in danger of being swept away by those, more or less the entirety of the intelligentsia in the West, who preferred ideology to truth. Running parallel to this idea of the restoration of poetry and imagination to religion was something else. Both Tolkien and Lewis recognized the reality of evil and taught the necessity of fighting it. In a way that’s what their books were all about. At the time they were writing even many Christians were embarrassed by the idea of the devil, preferring to see good and evil in terms of impersonal psychological principles. But our two writers knew better and in this, as in many other ways, they were prophets. Now anyone who is serious about trying to understand the spiritual world knows that dark forces, demons, call them what you like, exist and have tremendous power in this world which must be resisted. They cannot be compromised with. The best way to fight them is through handing oneself over to God and doing his will but this is not a passive thing as it was not for Gandalf or Frodo or any of the sons and daughters of Adam sent into Narnia to help restore it when things were going badly. It requires trust and hope and love of the good, and soldiering on doing one’s duty as Frodo and Sam did even when all seems lost. Pacifists don’t fight and they don’t win either. Obviously I’m not saying that one should never turn the other cheek but resist not evil does not mean giving way to it. I said they were prophets. Much of what Tolkien and Lewis wrote can be seen to apply to the present day demonic assault on mankind. I'm thinking of Saruman and the Scouring of the Shire (already started in Tolkien's day but now everywhere and seemingly irreversible) or even the whole of The Lord of the Rings, and, in particular, The Last Battle and That Hideous Strength. The Ring can be many things but it is certainly not inappropriate to relate it to modern computer technology which gives us great power but at what inner cost? I also regard the depiction of a small band of men and women of true hearts and good will working with the inner powers against the demonically inspired forces of a corrupt Establishment, as depicted in That Hideous Strength, to have more than a touch of truth to it. I wrote in an email to Bruce Charlton that these men were probably saints but that they, especially Tolkien, would almost certainly reject that title and look with extreme displeasure on any fool who gave it to them. Well, they’re not here to do so and I don’t suppose they care from where they are now. But if saints are those who faithfully carry out the will of God and work for him on this Earth then I don’t see why not. These two men performed a great work and are surely responsible for bringing many people to and, just as important, keeping them in the way of Christ over the last half century or so. They re-illuminated a light that was in danger of going out and did so in a way that inspired millions. In their stories, and in the case of Lewis, his religious writings, they not only provided lifeboats for sensitive souls drowning in a sea of atheistic materialism, they also gave us spiritual weapons to fight ignorance and evil. My, at the time, 9 year old son said to me a few years ago that The Lord of the Rings seemed more real than reality, and, of course, it is because it better reflects the truth in reality than what passes for reality in this world now. I once claimed, in response to a post on Bruce Charlton's Notions, that J.R.R. Tolkien and C.S. Lewis could be viewed as twentieth-century incarnations of the 'two witnesses' referred to in the Book of Revelation. That was silly and hyperbolic, yet my sense remains that the Inklings in general, and these two in particular, were sent by God to carry out a great creative work which would echo and resound and have long-term repercussions for good in the world. At first sight this might appear questionable. The Lord of the Rings and the Narnia books were published in the 1950s. Since then, the materialist worldview, ably assisted by social and economic liberalism, New Age 'spirituality' and post-modern vacuity, has made great strides in hollowing out the deposit of faith and culture that the West still possessed, albeit in diminished fashion, immediately after the Second World War (when Lewis's That Hideous Strength and Charles Williams' All Hallows Eve were published). It's staggering when you think about it, the amount of people - young people in the main - who, without Lewis and Tolkien, would have been deprived of such a fine and noble imaginative vision, such a potent alternative to the drab secularism masquerading as freedom which sets, it seems, so much of the world's agenda today. I say 'seems', because its power base is dissolving as I write. Its hold over the imagination is weakening. Liberal humanism has become shouty and shrill. It no longer motivates, unshackles or inspires. Its future appears limited, and the Inklings, I feel, have played a significant role in challenging and undermining its flat, one-dimensional, increasingly joyless manner of experiencing the world. But that's just the start. The Inklings story will run and run. Because what their writings point towards is nothing less, to my mind, than the great Christian renaissance to come - the 'Age of the Holy Spirit' prophesied by Joachim of Flore in the twelfth century and Nicholas Berdyaev in the twentieth. The reformers of the Second Vatican Council, to take the Catholic perspective I know best, sensed something of this approaching change, I think. They realised that what had become a sometimes rather rules-obsessed Tridentine Church might struggle to inspire hearts and minds in the modern era. Their (or their interpreters) mistake, however, was to throw the baby out with the bathwater, sidelining the sacred and casting off tradition in a doomed attempt to appear 'relevant' to a Zeitgeist which was already, in the late 1960s, shifting and morphing into something quite brazenly anti-Christian. The reformers, unlike the Inklings, lacked imagination. Their 'Spirit of Renewal', one feels tempted to conclude, has enjoyed its greatest successes only in de-mythologising large swathes of Catholic life. The body of work left behind by the Inklings, on the other hand, has helped re-mythologise the world and baptise the contemporary imagination. The Christianity of the future prefigured throughout the Inklings' oeuvre is different to post-Vatican II Catholicism. Like the Tridentine Church, it revolves around the sacred and is faithful to tradition, but is guided more by imagination than legalism, consecrating and making holy God's great gift of creativity - the 'flame imperishable' that Iluvatar, in Tolkien's Ainulindale, hurls forth into the void at the beginning of the world to bring life and light to all things. Fan fiction, derivative fantasy novels, and sophomorphic imitations aside, it is plain that Tolkien has unleashed a mythic awakening and Lewis a Christian awakening. 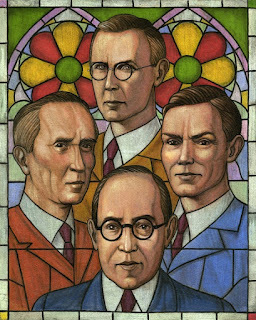 Tolkien fans are often surprised to discover that they have entered a Christian cosmos as well as a world of Elves and Hobbits; fans of Lewis's apologetic writings, on the other hand, are often discomfited when they learn about their hero's personal life, his relationship with Mrs. Moore, his hearty appetite for drink and ribaldry, and his enduring affection for the page and planetary gods. 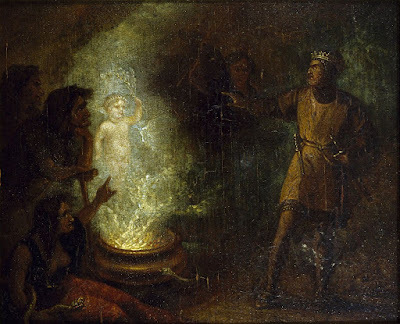 But Tolkien's mythology was deeply Christian and therefore had an organic order to it; and Lewis's Christian awakening was deeply mythopoeic and therefore had an element of spontaneity and beauty often missing from conventional apologetics. The Inklings' work, then, taken as a whole, has a significance that far outweighs any measure of popularity, amounting to a revitalisation of Christian intellectual and imaginative life. They were twentieth-century Romantics who championed imagination as the royal road to insight and the 'medieval model' as an answer to modern confusion and anomie ... Even when they were not on speaking terms, they were at work on a shared project, to reclaim for contemporary life what Lewis called the 'discarded image' of a universe created, ordered, and shot through with meaning. Philip Zaleski and Carol Zaleski. The Fellowship: The Literary Lives of the Inklings. New York: Farrar, Strauss and Giroux, 2015, p.510. Having written about the need for saints in an earlier post on this blog I thought one or two practical examples might not be out of place. Since this blog is called Albion Awakening I will focus on British saints and, as I wrote about a Northern saint previously, this time I will choose one from the South. I have a fondness for early saints who lived at a time when Christianity was fresh and vital and who also manifested, or had manifested, in their lives rather more of the supernatural than many who came after so my chosen saint comes from a thousand years ago. Once again I am going to use as my main source The Book of Saints and Heroes by Mrs Lang because I think this captures the aura of saintliness better than many more academic studies, which can tend to the intellectual, or overtly religious ones, which can tend to the sentimental. Presumably Mrs Lang was a practicing Christian but she seems more concerned with the holiness of her subjects than using them as a means to proselytise. As she tells the stories of these saints it is the true love of Christ and utter dedication to his work that's the unifying characteristic to them all. Dunstan was born in Glastonbury around 910 when King Athelstan was the ruler of Wessex which at the time comprised most of the South West of England. An auspicious event took place just before his birth when all the candles held by the congregation during a service at Candlemas went out, but then the one held by his mother was miraculously re-lit by a tongue of fire descending from heaven. The story, even if apocryphal, is charming. What better way could there be to announce the coming of a saintly child? Dunstan's parents were noble and he was given a good education by the Irish monks of the local monastery. 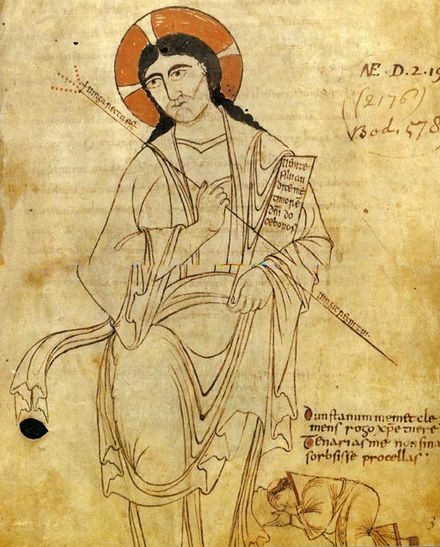 He studied the Bible, of course, but also the Latin poets and historians, and English ones too such as Caedmon, the 7th century Northumbrian poet. He learnt music, becoming an excellent harpist, arithmetic and geometry and also something of the stars. Practical matters were not neglected and he was taught how to design vestments for the priests and metalwork, making crosses and other items for church use. As late as the 13th century there still existed bells made by Dunstan in the church at Abingdon. All in all, he had the best and most rounded education you could at that time and I dare say it wouldn't be too bad nowadays either, though naturally a little limited as regards the sciences. Eventually Dunstan was taken to live with the King at his palace but his talents and intelligence aroused jealousy amongst the courtiers and he found himself accused of witchcraft and condemned to a test of innocence known as the ordeal of cold water. This was one of the milder tests of the time but even so the victim was thrown into a pond (or cesspool some accounts say) to see if he would sink or swim. Dunstan survived the ordeal and his life was spared but he was exiled from the court anyway so went to Winchester where he sought refuge with the Bishop who was his uncle. After some time the bishop had him ordained priest and he was sent abroad to a Benedictine monastery to study. When he returned to England he had clearly become something of a fanatic for he built himself a tiny cell too small even to stand up in and resolved to spend the rest of his life there contemplating God. He fasted to excess and it may be this that gave him visions of the devil who mocked and tempted him so much while he was at his devotions that eventually an exasperated Dunstan seized the devil by the nose with a pair of tongs and sent him on his way. This may sound like another apocryphal story but it is a fact that those who seriously set their feet on the spiritual path are the subject of attack by dark forces who seek to derail their attempts to come closer to God. Nowadays this may not take such an obvious form, so no need to buy a set of tongs just yet, but nonetheless it still exists. Though Dunstan's intentions were undoubtedly sincere this was not a healthy way of life to sustain for very long. It is not untypical for a spiritual neophyte who is trying to take the Kingdom of Heaven by storm to become a little fanatical but growing experience should bring one to the realisation that a more balanced approach brings better results in the long term. Luckily for Dunstan, in a story reminiscent of one from the life of the Buddha, who was similarly saved from excess by a young girl who gave him some milk when he had fasted almost to death, a lady of the court persuaded him that it was his spiritual duty to help others rather than concentrate entirely on himself. The sensible woman gets Dunstan to leave his cell. Note the tongs and fleeing devil! While still a young man Dunstan was appointed abbot of Glastonbury. He also came into great wealth as a result of some inheritances, and he used this to develop the abbey, building a new church and drawing up a set of rules for the monks based on that of the Benedictine order. Once again he became so respected for his wisdom and intelligence that his advice was sought by King Edmund and then, after Edmund's assassination, by Edred his successor. But when the 15 year old Edwig came to the throne Dunstan fell out of favour and was obliged to flee to Flanders before being summoned back when Edwig's brother, Edgar, became King of Mercia. Dunstan was now held in such high regard that when the incumbent Archbishop of Canterbury died he was made Primate of England. He used his power and influence with the king to bring about many reforms, both spiritual and temporal. Monks were encouraged to dedicate themselves properly to the holy life, something that had not always been the case at a time when becoming a monk was often used as an excuse for an easy life of indolence, simony (buying and selling of ecclesiastical privilege) was outlawed and so was the nepotism that had been rife amongst the clerical community. 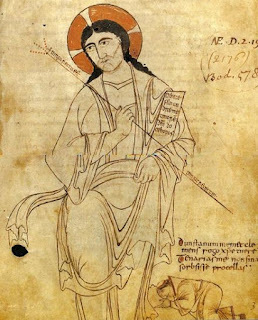 Dunstan also ensured that the poor were able to seek justice before the king, and that copies of the Bible were written and placed in the churches so that priests could more properly teach their congregations the facts of the Christian religion. He even required the king, as an act of penance, not to wear his crown for seven years and the king actually submitted to this, such was his respect for the archbishop. At the end of this time Dunstan devised a new coronation for the king and the form this took is still the basic pattern for the coronation of British monarchs today. The monk at bottom right has been identified from the inscription as Dunstan and the whole drawing may be by him too. After Edgar's death Dunstan's influence at court waned and he retired to Canterbury to spend his time in prayer and good works of a more mundane nature. He built churches and set up schools, worked to improve the lot of widows and orphans and practised the crafts in which he had always shown great skill. He made bells and organs and illuminated manuscripts. (Above is an example of what may be his work from the Glastonbury Classbook now held in the Bodleian Library.) But on the eve of Ascension Day 988 he was told by angels in a heavenly vision that he had just three days left to live, and to prepare for his passing. Sure enough three days later Dunstan died. He had served numerous kings and had contributed much to the wise running of the country. Unlike many saints he lived his life in the public eye, making laws for the good of the Church, trying to heal division, reform religious practice and bring together the warring English factions of the time. His is not a life like Cuthbert's, filled with miracles and wonders and largely devoted to contemplation, but one lived serving God in the outer world just as the lady who had persuaded him to leave his cell when he was still a young man had suggested he should. There is room for both sorts of saint. Charles Morgan (1894-1958) was an English novelist, playwright and essayist. He was born in Kent, studied at Oxford and lived most of his adult life in London. He was a household name in Britain, France and America during the 1930s, '40s and '50s, yet his work has disappeared almost without trace since, certainly in the UK. Morgan's writing style is quintessentially English. One senses the cadences of the Book of Common Prayer and the heritage of the Romantic poets in everything he writes. Yet, paradoxically, he was honoured more in France than England, becoming an officer of the Legion d'honneur in 1936 and a member of the Institut de France in 1949. His essay France Is An Idea Necessary to Civilisation was highly influential in wartime France and feels especially relevant today as that country struggles to reforge her ancient identity and stave off a myriad of largely self-induced crises. 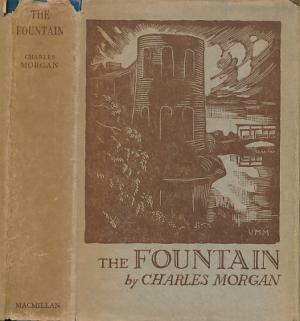 Morgan's finest book, at least out of those I have read, would probably be The Judge's Story (1948), a flowing, harmonious tale of self-discovery, treating the profoundest of themes with the lightest of touches and calling The Tempest to mind in its meditative grace and distillation of the wisdom that comes with age. 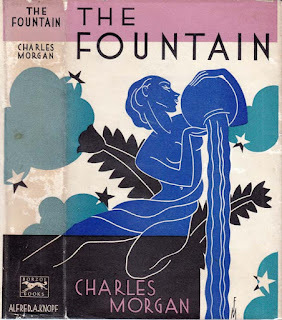 The novel I keep coming back to, however - the one I'm always flicking through and brooding over - is The Fountain (1932), a 431-page epic that won the Hawthornden Prize in 1933 and was chosen as Book of the Month in the USA. The source material is primarily autobiographical. In 1914, Morgan was sent with the Naval Brigades to the defence of Antwerp. His battalion found itself lost, then trapped across the border in neutral Holland, where they were interned in Groningen. Morgan and a number of fellow-officers were then transferred to a secure fort at Wierickerschans, a fortress on an artificial island. He was there for a year, before being released on parole and sent to Roosendaal Castle, the seat of the aristocratic Van Pallandt family. Both castle and fort play central roles in The Fountain, though the Van Leyden family portrayed in the book is fictional. It was during this internment that Morgan first encountered the French language, culture and civilisation then still current in Dutch aristocratic circles and wrote the first draft of what became his first novel, The Gunroom. Lewis Allison, the male protagonist of The Fountain, is a thirty year old British officer in exactly the same situation as his creator. A publisher by trade, and a former private-tutor, Lewis welcomes the quietness and opportunities for meditation internment will necessarily bring. He is writing a history of contemplative spirituality and is engaged on a search for stillness, inner focus, and what he calls 'singleness of mind'. The surprise appearance of an ex-pupil, Julie Harbury, now living in close proximity in Holland and married to a recuperating (though severely wounded) German officer, Rupert von Narwitz, disturbs Lewis's equanimity and sets the novel's plot in motion. What follows is a sustained fictional meditation on the meaning of life - on the quest for holiness, authenticity and vocation; on our fallen world and the circumstances that sometimes separate us from those we feel called be with; on the social pressures that seek to silence the inner voice of truth; on the clash between individual desire and the demands of tradition; on the blessings of books and music, on a fraternity of the spirit that transcends war and national rivalry; on the fragility of human loves; on the immortality of the soul; and much, much more. There is, in short, a tremendous amount going on. Morgan takes his time in expressing it too. The pace is relaxed. Ideas and themes are left to marinate. Despite this, judging by one or two dust-jackets, it isn't always clear that publishers were fully in tune with the novel's premisses. It's certainly not the kind of story this cover tempts the reader with, for instance. Yes, there is an undeniable physical element to the love Morgan's protagonists feel for each other. The Fountain, without doubt, is a highly erotically-charged text, but this is an eroticism transmuted by the intellectual and spiritual communion between the characters, this being the deeply Platonic context that animates and drives the narrative. ... creates far too genteel an impression. The novel is much more primal than this, reminding me, in many ways, of cities I feel particularly at home in, such as Liverpool or Rome, where one encounters both high and low culture with very little in-between. The younger members of the Van Leyden family are the closest depictions we find of the classic 'bourgeois' mindset - materialistic, staid, and unimaginative - similar, in their own way, to the Watson childrens' parents in Alan Garner's Elidor: too ensconced in newspapers and TV to be in any way aware of their offsprings' adventures on the borderland of the mythic and the everyday. The illustration at the top of this piece remains my favourite due to the stylish art-deco ambience it conjures. 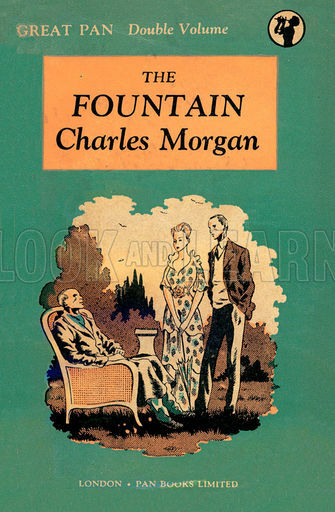 The dust-jacket that best reflects Morgan's themes, however, is surely this one. An image of mysterious wisdom won by toil. This is the garden, this is the 'Narnia', these are the mountains, which the characters in The Fountain seek and, in flashes at least, come close to discovering. The Fountain sold 100,000 copies. It seems extraordinary, looking back from 2016, that a novel of such density and erudition could prove such a best seller. It is tempting, perhaps, to speculate that this could never happen now - that reading tastes have degenerated to such an extent that a book like this would be practically unreadable today. I actually feel the opposite to be true and that, given the chance and the backing, the book might sell closer to a million copies than 100,000. Morgan saw himself as an inheritor of the Platonic tradition, and Platonism, as we have seen, revolves around something real and true; something that chimes and resonates with the human condition in every time and place and gets down to the very essence of who we are - this longing, this crying out of the human soul for a beauty and depth of experience which can only be found in Eternity and which this world, for all its charms and qualities, can never fully satisfy. Morgan felt this longing all his life. So did C.S. Lewis. So do millions of men and women in Britain today, cast off and left to drift in the post-modern void, their (and our) souls crying out for a dignity and nobility; a meaning, pattern and purpose - both individual and collective - which liberal, post-Christian society seems unwilling and unable to honour and even attempt to fulfil. 'As a pupil loves his master,' Lewis replied, and, going out of the hut, he looked up through the branches to the sky, seeing that the storm had passed. 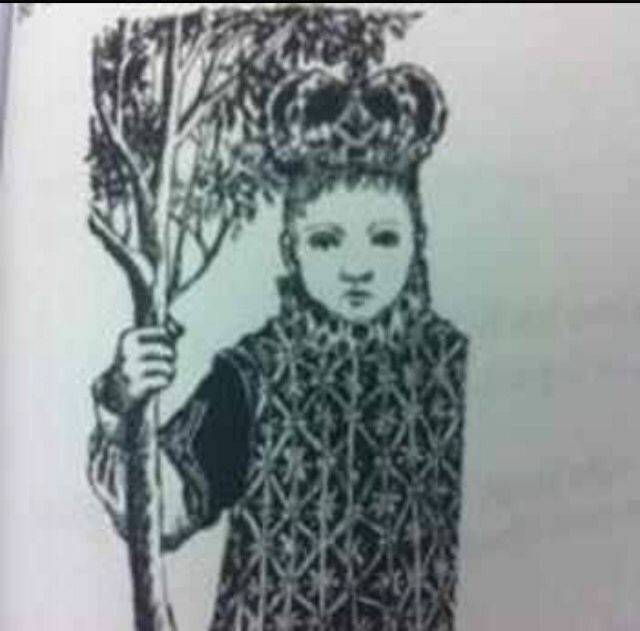 The branches, even the highest moved little. The wind had dropped and between the western beeches a reddened sun was slanting into the wood. Julie also came out, and stood beside him. Through showering sprays they went on to the moor. As the gloom of the copse fell back and the heat expanse of the evening sky shone upon their faces, they were touched by the blissful awe of those who, in the instant of beauty or love, are bound in a common wonder and look deeply into one another and speak silently as they cannot at other times. For the spirit of man is blind and dumb except God touch him, and awake, in the winter of his flesh, the spring of immortality. The air, cooled and polished by rain, had that transparency with which at sundown on wet evenings it is sometimes invested, as though the substance of it had been drawn away and there remained between earth's floor and dome only a lucent emptiness edged with crystalline fires. Soon the crystal would be stained by dusk, the forms of earth thicken and night flow on; but for a little while the trees dreamed above their shadows and time slept. Lewis and Julie waited. At last, when the heather had begun to darken, they set out towards Enkendaal.